25:32 – Selections from our Sunday Morning Worship Service at The Unitarian Universalist Congregation at Montclair by Ms. Deb Ellis. 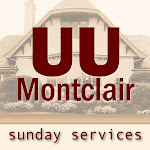 27:12 – Selections from our Sunday Morning Worship Service at The Unitarian Universalist Congregation at Montclair by Rev. Dr. Justin S. Osterman. 23:14 – Selections from our Sunday Morning Worship Service at The Unitarian Universalist Congregation at Montclair by Rev. Dr. Justin S. Osterman.